Next up is Zee El Mikatti. Zee’s project ‘Nothing like the picture’ was an investigation into the use, mis-use and subversion of instructions. The main reason I’m writing about this project is the idea of interpretation within the design/making process – I’m currently working on a project that explores the leaps of faith, translations and interpretations within design drawing and modelling. Zee started her project by cutting up instructions, in a Burroughs-esque manner, then following the new instructions she made new objects. 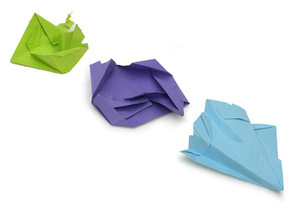 The first example of this was origami, she used the frog as an example. The pictures below show three different shapes remade using cut up instructions. What I like about this is that you can see a faint glimmer of the former animal – unfortunately they have become mutated – they’re freaks! Zee became interested in how this method could be used as a generative tool for new forms of furniture. 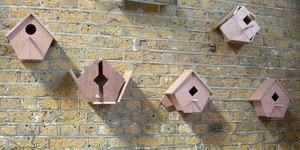 She started applying the method to traditionally simple objects (in terms of making processes). 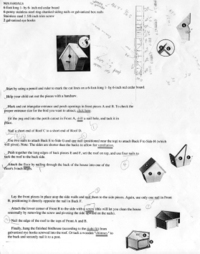 My favourite experiment was with the construction of a birdhouse. By reordering the instructions, a fantastic range of objects was produced. In Zee’s viva she explained that in order to follow the cut-up instructions she had to interpret them within the context of making – some things didn’t make sense, or follow on from the previous step, so she had to make judgments and decisions in order to make the object work. For me, it’s the gap between instruction and object that is fascinating (and the interpretations that are made), mainly because I believe this gap exists in many forms within the design process, I’d even go as far to say that the way in which the gap is crossed is where the real poetry in design lives. In the move between 2D and 3D (more specifically, between the sketch drawing and the maquette or prototype) a translation occurs, however experienced you are in drawing a 3 dimensional object, the physical reality always behaves differently. But in the move, the journey between dimensions, really exciting things happen. I've learned its all about proportions first, then you can figure out the hard parts. Almost like how to draw people with paper.